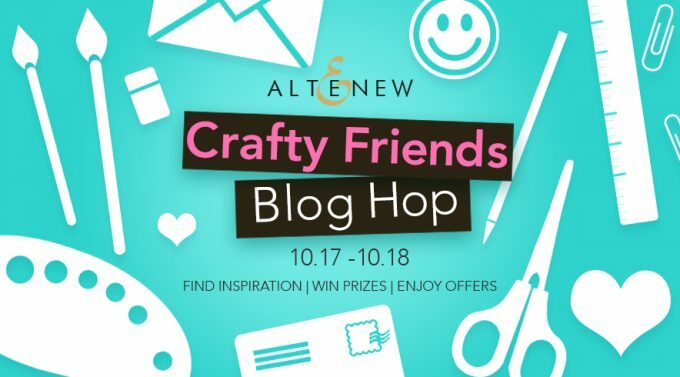 Hello and welcome to Altenew Crafty Friends Blog Hop! You probably came from very talented Keeway Tsao. 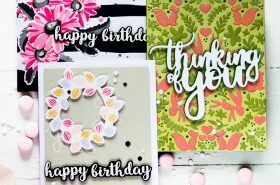 If not – you may consider starting from the beginning at Altenew Card Blog and see what other designers are sharing (and also you have a chance to win a prize on each stop). Crafty friends mean a lot in my life. First of all currently they’re almost my only friends. I do not have many real friends here in US (just a few). But I do have a lot of online crafty friends which I share my passion with. And even though our friendship started with our love to cardmaking with time in evolved into much more, touching other parts of our lives. We share thought, feelings, gossips (let’s be real here) and much more! Some of them I never met in real life and maybe never will. But they mean a lot for me! Some of them I was lucky to meet in person and now I miss them every day! Back in April I went to Simon Says Stamp CREATE. Thanks to my friend Yana who notified me that tickets are being sold out very quickly and I was able to get mine when only 4 left! I was hesitating before if I should go there or not. Since price was a bit high. Now I understand how wrong I was! First of all all those classes, demos, free products (which I hardly was able to fin into my suitcase) – all that was totally worth the price! But more than that – I was able to meet in person SO MANY crafters! I never met so many crafters in one place in real life. There were so much energy and fun, one of the best experience in my life! It was like a vacation (vacations cost money, don’t they?). I made a fall card to celebrate this hop featuring several my favorite techniques. I started making it by cutting a panel out of Solar White Cardstock along with cutting a mask out of masking paper using a die from Halftone Hearts Die Set. I applied the heart mask onto the panel and stamped Wood Pallet Background using Jet Black ink. And then I inked the whole panel (still with the heart mask applied) using the same ink. I was using MISTI for stamping and left the background stamp mounted to its lid while took the panel to ink it up. I then applied the negative mask onto the panel, around the blank heart shaped space and stamped the same Wood Pallet Background using Firebrick ink. And then I inked the area inside of the heart using Autumn Blaze ink. I die-cut fall word out of the panel using Bold Alphabet Die Set. Along with die-cutting each letter out of orange cardstock. After which I glued each letter die-cuts one on top another placing the one die-cut from the panel on top. I made a card base out of Solar White Cardstock and adhered the panel onto it. I made it a bit smaller that an A2 size (but mostly because I made a mistake when was trimming the panel and trimmed it too much lol). I applied adhesive all over the card base and stuck the panel onto it and inserted the dimensional letters into their negative space. I die-cut a bunch of leaves using With Gratitude Die Set and colored them with markers. After which I adhered them in the top and bottom part of the card. I stamped happy label using Label Love Stamp Set and adhered it onto the card. Lastly I added several NUVO droplets to accentuate the card. Altenew is giving away a $100 Altenew prize pack to FIVE lucky winners. I will also randomly choose a winner from comments left on this post and the prize will be $20 gift certificate to Altenew online store. Please leave a comment on this post by Wednesday October 25th at 11:59 PM EST for a chance to win. I will announce the winner here in this post on Thursday, October 26th. The winner of $20 Gift Certificate is Mary. The next stop in the blog hop will be amazing Galina Filippenko. If you got lost, please go back to Altenew Card Blog. Love, love, love the simplicity and elegance of this card! Your card is stunning. The orange really stands out against the black background and I love the dimension of the alphabet. Thanks! Fabulous use of alpha dies. I love that this card is TOTALLY different than anything I have seen. Two colors and lots of texture. Such a neat card-so perfect for autumn. Wow this card is really cool! I love it!!! Fabulous bold and bright card!!! Love your very colorful fall stamp. thanks for sharing! That alpha set was the best investment I have made with my craft supplies! I love all the uses for it. Svitlana-I have found that those craft fairs/gatherings are WELL worth the money, so much fun! Thanks for sharing that everyone makes mistakes and we just have to work with them 😉 great card! This is stunning! I love how the letters pop out from the center of the card. The contrast between the leaves and the background is gorgeous! I so love this bright orange on black. Just is so striking. I really love this autumn card! The colors are vibrant and the background is interesting. Beautifu lcard! I love how the woodgrain is in the heart too! I’ve been making cards since 2006 and love finding friends on crafting blogs. WOW I love your bright and bold card. The black and orange are stunning. Love those fall colors. So vibrant. There is something about those large alphabet dies…. beautiful. Love the bright, bold orange against the black! Well done! What a striking card. Love it’s boldness. I have the alpha die set you used and find i use it a lot. So happy i got it. What a bold color scheme. I love it!! I am falling in love with that FALL card! Bold and Colorful card..I loved the background and of course the heart..Thanks for explaining!!! I love how the orange pops on your card. So vibrant! It’s really beautiful. Wow! Love the striking colour combo! This is an amazing card! I love the colors. Your card is gorgeous! I love the contrast of the bright orange against the black background, it’s stunning. This is really unique! I love how the words seem almost invisible or transparent – really cool! I never would have thought to do that. Thank you for sharing your technique. Cool card! Love how the “FALL” jumps off the card! I love the colors you selected for your card, and how effective they are. I often see die cutting out of the background. Time to revisit that tecinque on my cards. Thanks for sharing. Love the colors in your fall card. Thank you for sharing your talent. Absolutely breathtaking and AMAZING! I love the brilliant orange against the dark background! It is eye catching and really showcases the beautiful images! TFS! I love your design, very cool! Altenew products are so fantastic, aren’t they? Oh Wow!!! I love your card!!! Gorgeous colors for a fall card – love it. WOW, what a bright and beautiful card! I love fall! Your card is pretty great too. Thanks for sharing your talent. Beautiful project, great bright colors! Love the colors, it’s a beautiful fall card. Beautiful bold card. Love those bright colors against the black. Have a great day! Your card is just STUNNING!! I LOVE it and I will be saving this one. The black against that Firebrick is just amazing, it pops so well. I have to get Firebrick it is the coolest color I have seen and I also love those alphabet dies Altenew has, they have been on my wish list for too long, the are fantastic on your card. 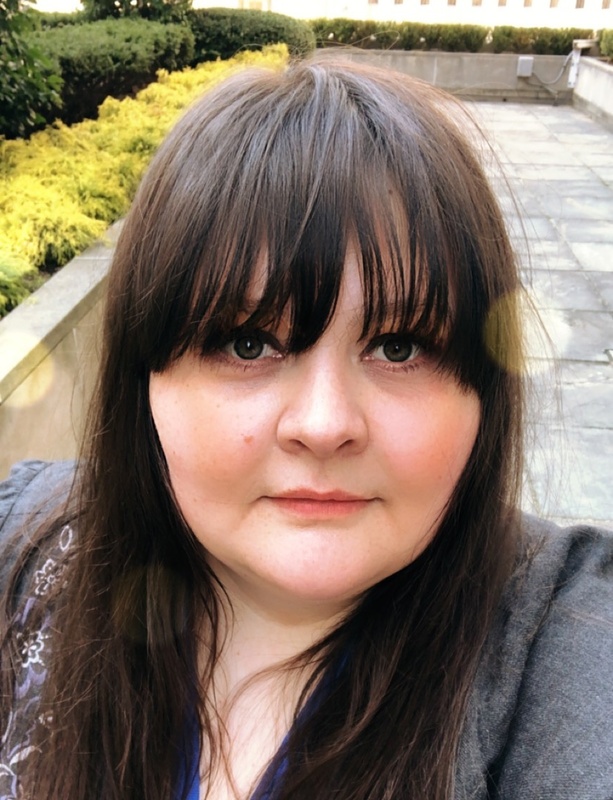 Thanks for sharing your story, and your wonderful blog I really enjoy it. I was sharing on the Altenew blog that I am disabled and don’t leave my house and that is why even thou I have been doing scraping and cards for over 20 yrs I have never meet any friends online, nor like you do I have any here at home. Thank god for my husband, we are together 24/7 and are soulmates and at least have each other, and we always say as long as we have each other that is all we need. Thanks for sharing your amazing card!!!!! Beautiful fall card. Altenew has a great stamp line, fun to see many different ways to use them. Thanks! Striking card. The black just makes all the colour elements pop. Great dimensions and details. Love the hidden die cut letters with my favourite alphabet die set. This is an amazingly beautiful CAS card, Svitlana! The fall colors and the detail everywhere – it’s a work of art to be framed. Wow what an amazing work! I’m always so happy to come to your blog and see such beautiful work! Love this idea! Definitely going to give it a try. I love this card. I have never been much of a fall person, I like winter and summer….which in AK those are really our only seasons 😉 but I do love this card. The color choice is amazing. Thank you for sharing. I love that wooden pallet background stamp! Hope to win 🤞🏻! Oh my, what a bold statement! Love it! Awesome card, so graphic, love it. love that card! It’s gorgeous! I love how you show a very different style from all the flowers you usually see at Altenew. Love the colors, very bold and striking. Lovely card. Absolutely stunning card, love love love it. I love fall and fall cards. Yours has definitely inspired me. Oh Svitlana, this is just AMAZING! WOW!!! Such a beautiful card. The colours are amazing together, very beautifully done as ever! I think this is the prettiest fall card ever! Love your card. Just beautiful! Gorgeous Fall card! Love the orange leaves and word on black, very striking! Love the color contrast and how you placed the word fall on the heart. This is a unique and beautiful layout! So much interest and dimension. Love it! Such a striking card! I love it!! As I sit here shivering I have to admit, your card says fall in the best of ways. Beautiful! Wish it said spring (and was). 🙂 Thanks for sharing such a lovely sentiment of where I’m at. I so want those letter dies! Beautiful card! I love your card. I have the bold alphabet dies and love your use of them. Thanks for the inspiration. Gorgeous card. The brilliant oranges and bold letters are striking against the dark background. This is one of my most fav cards from the blog hop till now! Love love love the bold FALL sentiment and the colors! It’s so perfect that it doesn’t even look handmade! Love the color on your card!! Wow love love this card! It’s so vibrant and bold. Such a modern look, love it! Wow! Love how you did the lettering on this card. Must give this a try. I love the design and texture of your card! It’s fabulous! Wow! What a neat technique. Can’t wait to try it myself, thanks! Love the drama of the orange & black together. Also the dimension of fall. Very original composition. Thanks for sharing. I feel the same way about my online crafty friends. Wonderful Fall card. what a beautiful fall card. the heart just pops. Thanks for sharing your creativity with the world. Wow! Love this card. The bold colors really make a statement! Love this FALL card – so unique! What a beautiful fall card! Love how you inlaid the sentiment. Gorgeous card. I love the clean simple design and bright eye-catching colours of autumn. What a stunning card! I’m not normally a fan of orange, but it looks gorgeous with the black and the fall sentiment. I love it! Love your card. What really caught my eye is the colors you used in making a card that wasn’t Halloween! WOW! What a striking card! I love the label tape stamp sentiment too. I have always used a Dymo label maker and their tapes on my cards a lot….but after seeing this stamped one I want that set!!!! 🙂 GREAT job on your card! Fun crafty friends and fun blog hop…..thank you! Love the bold color of the orange! I liked the, “real talk”, on yiur blog post it made me smile. This card looks so simple but in readung through it, it is very detailed. The things I deem as “simple” are always the hardest for me to do hahaha. Your card is fabulous! Love the design & bright colors. Thanks for explaining how you made it! A favorite fall card!! What a stunning fall card! I love how the orange just pops against the black. Your subtle use of the woodgrain stamp is perfect. Wow! What a gorgeous card. And with only a few colors. The orange and black really stands out. Love it! I really love the contrast of colors, the result is awesome ! I love love your card..beautiful colors and a great fall card. Just breath taking. Thanks so much. Wow! I love the black and orange together, beautiful card! This masking thing is really fun. Love learning how to do it. New for me this year. Now for me to give this a try with your card. Never to old to learn a new thing! Beautiful card. Thanks. Wow what a gorgeous card! I wish I was able to attend to such crafty get togethers! I would definitely be starstruck! I love your card—very bold! WOW, I can’t stop looking at your card, it is fantastic! What a beautiful card. I love the letter technique. Thanks for sharing. What an awesome card. Love the vibrant colors and the layers of leaves, bug letters of Fall. So lovely. Great card, the colors are so bright and wonderful. And I love your story about your crafty friends and how important they are to you. LOVE the pops of Orange:)) Your cards are so unique! Wow. What great techniques and colors. This is a stunning and unique card with a great color combo. This is a really unique card, I love the colours! What a great inspiration! This card is awesome! I love the bold colors! What a gorgeous, bold card! What a bright and lovely card for fall, with some great techniques. It’s lovely and a privilege to have crafting friends and I’m so happy for you that you are getting to know more of them. Beautiful fall card – I love the strong colors! I love all things wood grain. Such a beautiful card. i love what you did with this card! very dramatic colors but so simple in design. beautiful job! love love love what you did with the Bold Alphabet dies. Maybe I will win a prize so I can get them, they have been on my wish list ever since they came out. Love, love LOVE this card! So bold and bright – and the popped up fall is just fabulous! Thank you for sharing your talent and inspiring us! Of course, now I have to order the wood pallet background stamp! Wow…this card is stunning!! It would be a dream come true if I were to be able to go to a crafting event!! I want to so badly, but have never gotten the chance to go. I don’t have any crafty friends to go with me, and I wouldn’t want to go alone. Maybe one day I will make it to one. I hope to meet you if I ever do. Thanks for the beautiful card share!! I really love how all the orange is popping up on the dark background. Love how this card combines Halloween and fall! What a beautiful card! Love the vivid color on black! Love how the sentiment justed pops off the card. Stunning card! Thanks for sharing your inspiration with us! I love your technique and the fall orange color on the black background! This is such and Amazing unique card!!! I love everything about it! Beautiful work! WOW!! I love that background wood look!! It is so cool with the colors you chose and the style!! Stunning!! Thank you for sharing with us!! Thank you for the post and the great blog hop. You make great cards! Wow! What bold colours! I love it! Wow! That’s what I said when I first saw this card. I love the bright and bold colors of orange. Sadly, I don’t have many crafty friends but I hope to change that soon. TFS! I’m always so inspired by your gorgeous work! You are so talented and we are fortunate that you share so willingly, even when you make mistakes! 😁 The vibrancy of your card is fantastic and that orange heart just leaps off the page! Love the idea of using the woodgrain stamp for it as well as the background. The crafting community is indeed a welcoming and generous group! So glad you’ve been able to get to know more friends through that community! Great Fall card!! Love the boldness of colors!! This card is amazing! I love the pop of bright color under the letters. What a super fun card!! I love the POP of Firebrick ink. I just love how the orange pops against the black on this card. Love it. Thank you for sharing. Love your fall card! Very bold and outstanding! Beautiful card, love your striking colours. Great dimension too! Your card is very fall looking!! Here in South Dakota, we only get yellow and brown. Not too many trees with red and orange. I miss that!! What a lovely card! I wish it was Fall already here in LA… it’s about 95 degrees today!!! I just LOVE your style and this card is so beautiful, as are ALL of them! I love the wood pallet background in the 2 colors with the masking technique and the leaves details across the top and lower right corner are brilliant! I love the bright orange leaves. Very clever die cutting of the word Fall. It is very effective. What a striking and stunning card! I love the raised fall letters! Beautiful! I just replicate this technique! Thanks for the inspiration and for the opportunity to win! ♪ ♬ ヾ(´︶`♡)ﾉ ♬ ♪ Love the bold colors! That’s such a wonderful story. I only dream of being able to go to crafty stuff like that. But I can live vicariously through all of you. My husband built me a wonderful craft room, that I am in almost every day, and thanks to all of you, I get inspired to make beautiful cards for my friend, family, and strangers. Thank you so much. Your card is beautiful. Wow! So different but gorgeous. Fall colors just pop. I love this technique! This card has such a beautiful impact! Oh my colors that pop off the page! Striking card . I like your use of colour to make an impact. Great bold card, really like your style! Your card is stunning. Fall is one of my favorite times of year. Most of friends I have are crazy online friends that do not even know my name. I’m disabled and other than my husband and small amount of family I just watch u tube and learn all I can from all of u. It makes u feel really close to everyone. Thank u so much for sharing your talent with us. what a fantastic fall card!! love it!! Love your use of bold colors. Bright and Bold. 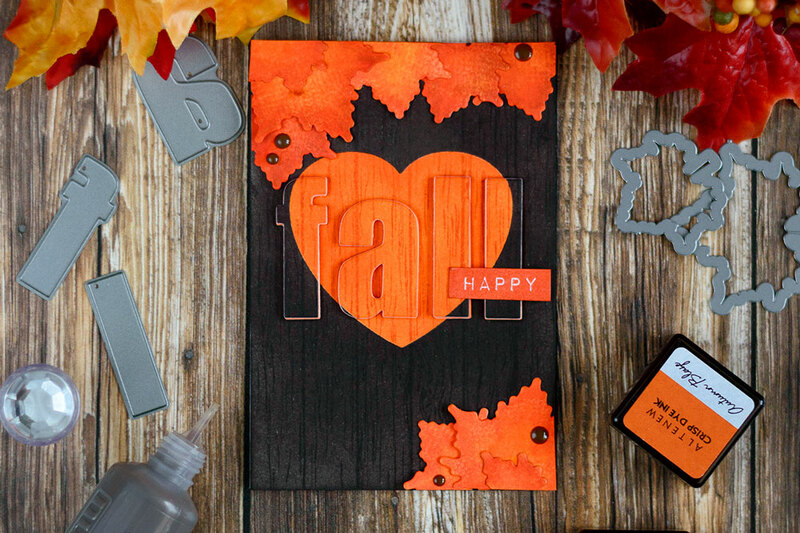 A fun fall card with an interesting use of a heart. I love this idea – and I love the peak of orange from the popped up letters. Just beautiful! Love the vibrant colors of your card! Very creative! 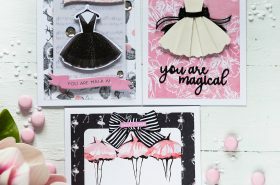 I always enjoy spotting your cards in any blog hop! They stand out! I like the dimension and the bold Fall colors. I love, love, love, your card. Fall is my favorite season. Your color choices are very appropriate, and lovely. Thank you for sharing your talents. I love,love,love this card. you did a great job. The wood grain is subtle yet so present over the entire card. It also has the Halloween vibe in your choice of color without saying it. Wow, this is stunning!! The colors are amazing!! So striking and gorgeous!! Thanks for the inspiration!! I just love this card! It is so simple, but has such an incredible impact! Thank you for sharing the technique used to create the woodgrain effect. I haven’t tried it before, but I will now. I love this card!! It is bold and stunning!!!! LOVE!! What a card! So bold and beautiful! What a great fall card! I love your story. That’s the wonderful thing about the internet – being able to find a community that shares the same passions for stamping as we do. I also think all the bloggers like you are so very generous to share ideas and techniques. Love that orange! And your design is awesome. Thanks for sharing. Really beautiful card. Love the creativity. Thanks for participating. Such a beautiful cheerful card. I love the change of pace from the browns and muted fall colors. What a fun card! So creative! Wow, the colors are great and I want to try eclipsing a sentiment. Your fall card is very cool. The orange is so bright, but the fall is kind of hidden, with peaks of orange showing through. Love it! Nice to meet you and read your blog. First time for me, but won’t be the last! I would never have thought to ink the whole background in black and use the woodgrain background also. You really opened my eyes to a new idea! Beautiful card! Love your creation! Gorgeous card. Love the bold colours and that fabulous big sentiment. Autumn is just the Best! And your card with woodgrain and leaves is very cool! What a beautiful, dramatic card! What courage it took for you to move to a new country! I thought I was brave moving 400 miles away from my family when I got married. Thank goodness for crafty friends. I don’t know what I’d do without my little group that gets together every month for lunch and some creative therapy! What a striking design Svitlana! Love fall and your design is one I may have to replicate, I hope you dont mind. Thanks for the wonderful inspiration! Have a wonderful day! Bold, vibrant colors, Svitlana. Terrific! I really love how you placed the orange fall words over the heart with the continuous grain look!! You will love CHA. Wear comfortable shoes!! Bring extra battery chargers…your camera will be on overload 🙂 Love your creativity. Your color combos are amazing. As always, you have created a wonderful card! The background stamping is really clever, and the colors are fantastic. It’s a gorgeous card! 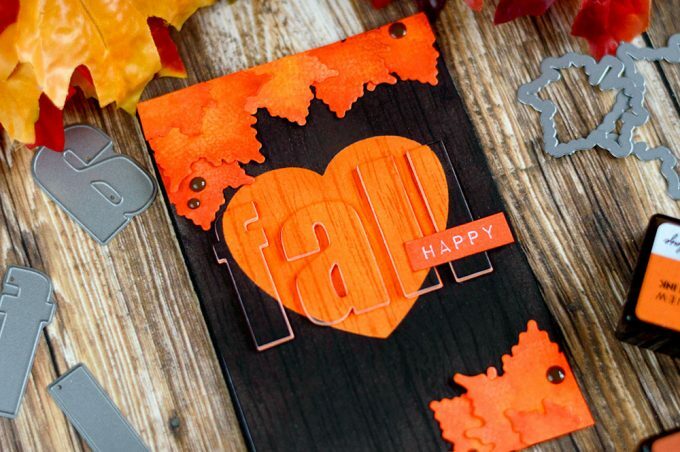 Love the colors and how you die cut the word fall on your card. Love love love this card!!!! That wood background texture is just amazing!!!! Wow so bright and bold!! Stunning card! Love your card – choice of colours and design creates such a striking impact. Well done!! STUNNING and BOLD! Gorgeous CAS card design. I love the subtle texture of the wood grain on the black and orange heart! What a stunning card. Thank you for sharing. Absolutely gorgeous! Love the colors! Absolutely love these colors.. your card are amazing with the die cut ..thanks for inspiration. Your black background adds a sense of drama to a lovely card. I love that this card is Halloweeny without relying on the stereotypical imagery. The wood grain is a great effect! I love this modern vibrant fall card. It’s lovely. Your card is beautiful! I like how you created the background and the heart. The textured look of the wood stamp is fabulous on this card! Stunning card. I love that orange color. Just Perfect. Great card! 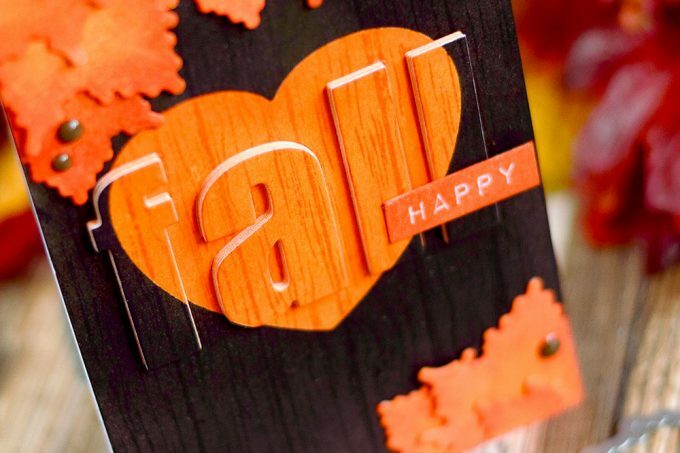 The colors scream Fall and the die-cut “Fall” technique is the exclamation point of the card. Love it! I really, really love your card! The colour contrast is awesome! Love the black and orange, very autumnal. Thanks for the chance to win. Pretty shade of orange against the black! I love your story & totally relate to “my online crafty” friends are the best. Someday I hope to meet all these fabulous crafty ladies and gents. I love your card. Have a blast at CHA in 2018. Thank you for sharing. Wow, what beautiful contrast & design. Thanks Svitlana for sharing your great design. I always love your cards and designs. This time, I love hearing about your crafting friends and how they’ve become so dear to you. Glad to know you’ve been able to go to the events and meet some in person! Stunning card, love the colors and the technique! I absolutely love this card! I think the raised letters are great, they add so much dimension to the card. You did a wonderful job! Thanks for the inspiration! What a fun, bold cards! Stunning card. I love the dimension and color combination. Lucky you! first create and now CHA! Lovely bold card! Perfect fall card, with the bright bold colors. Can’t tell you how you made my night by admitting that even someone as talented and creative as you can occasionally make a mistake! Thanks for the smile that brought to my face! Envious of your trip to Create and now CHA to come. Enjoy! I really love this card, bold and beautiful! Your card is STUNNING!!! Such vibrant autumn colors. What a beautiful, vibrant card! Beautiful card as always and very appropriate for this time of year. Your fall card just rocks!! The deep rich colors you used are simply warm and cozy…and quite a delight! I enjoyed reading your story Svitlana and I love your style, you are so very talented. Wow! Your card is amazing! I love the raised Fall. And your color scheme is so striking it really shouts fall! I just love it! 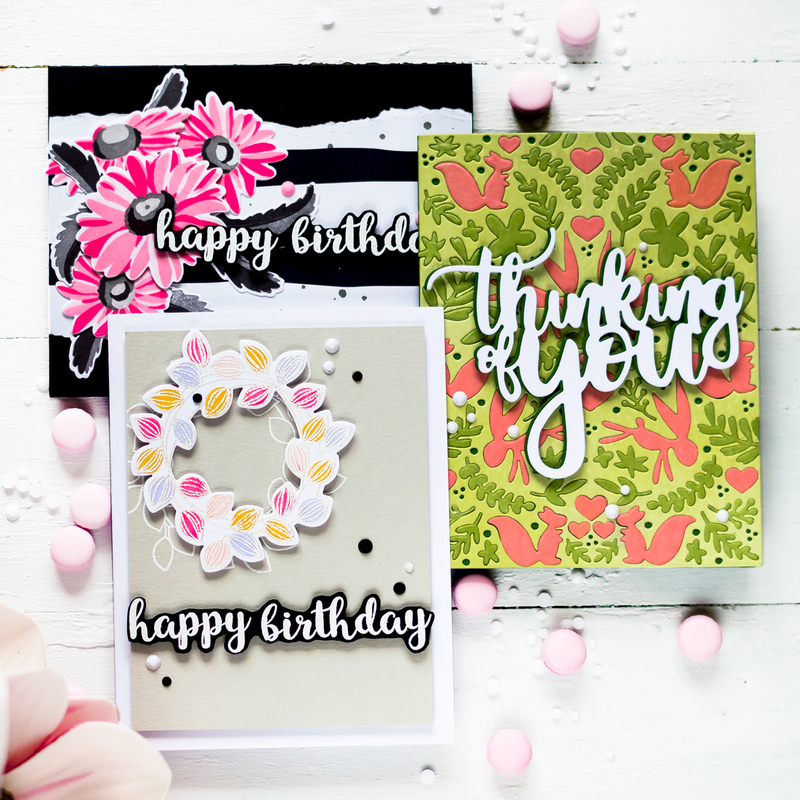 Where would we be without our crafty friends – they inspire us, encourage us, and give us excuses to continue making ever more cards!! Thank you for celebrating them with this fabulous blog hop! Love the colors you used on your card. I love this technique of insetting the letters and inking them the same as the background. The colors used are fabulous as well. The colors of fall are so vibrant, it is not hard to love them. The contrast of the black really makes them pop. Your card is so beautiful! I just love the technique that you used. I may have to try this technique. Thank you for sharing your beautiful card! I love the combination of the bright oranges with the black. It really makes your card feel like fall! Thanks so much for sharing. What a great card! Thank you! Such a bright and beautiful card 🙂 Love the orange with black! I have got to try this technique! I love the way the word is camoflauged into the background. Love the effect of orange & black . Thank you for sharing your story and your card – I love the bold graphic layout. I absolutely love the pop up letters. Really need to try this! Such a striking card, superb technique and colour combos. LOVE it! I *LOVE* the clean look of this card and the colors are beautiful! Thanks for sharing! Love this color combo! perfect for Fall! Thank you for the awesome inspiration! Very interesting and clever technique to make such a striking card. I love the Fall card so much. It’s so vibrant and makes me very happy looking at it! I love how you stacked the alphabet die curs to make rhem 3d. How clever! Such a stunning card! Unique and perfect choice for colors! Thank you for sharing. This is a perfect card for October! Great job! Ohmygoodness! This is the most beautiful fall card I’ve ever seen! What a lot of detail! The card is lovely. Love your bold fall card. You come up with the most interesting designs. I love it! Love that wood background you used! Very fall inspired! Stunning color..technique/design is so creative…love it. Really like the fall sentiment very nice card. I also hope to build a network of friends through crafting. Most of my local friends do not share my passion for crafting and creating like I do! Lovely, bright, bold card. Thanks! What a fabulous theme for a blog hop and I agree: crafty friends are the best! Meeting several in person has been one of my highlights of card-making! I’m so excited you’re going to CHA! Your fall card is stunning; so dramatic with the orange and black! Thank you for being part of this heart-warming celebration! What a gorgeous card! Love the use of the stacked Fall and the colors are so fallish…love it. Such a striking card. I love the contrast of the orange and black. Thanks for sharing your story. Like you I don’t have many friends and non of them are crafters,so you all are my friends. I love getting to know each of you. Love the contrast of the colors in your card. So striking. What a fun fall card! Beautifully done! Oh I must try that letter technique!!! Amazing contrast of colors!!! Love it! Beautiful colors. Beautiful work. Thanks for sharing. Beautifully simple, look forward to making this card as well. I’ve been wanting to try an eclipse card! Love the pop of color on your card. Perfect choice for fall’s many wonderful colors! Very effective card! Love the technique! This card is just amazing! So striking. I absolutely love it and want to use your idea for one of my own! Thank you! The black and orange combination looks amazing! OMGosh! This card is absolutely gorgeous! I love the vibrant colors. This is so autumnal! Very neat how the letters follow the color pattern. Great card; a real eye-catcher ! Beautiful colours in combination with those big letters. Thanks for sharing your creativity. Wow! What an amazing card! I love this crafting community and the fact that it can bring people together from all over the world. I have “met” some wonderful friends in places like Florida (USA) and even New Zealand! I love this beautiful fall card. The orange and black are beautiful. This is such a beautiful card for fall! The colors and design are stunning! Beautiful! Love the dark wood feel. OMG!!!!! What a statement I can’t wait to try the lettering technique, thank you for sharing! I love Altenew’s Woodpallet Background stamp. It’s definitely on my wish list. I love how the details show even in black. Your card is awesome but sounds rather complicated for me to attempt. Thanks for sharing your friendship story. I also love the company even if it is online. Love the card, can’t wait to try doing one myself. Aren’t you clever! I like it! 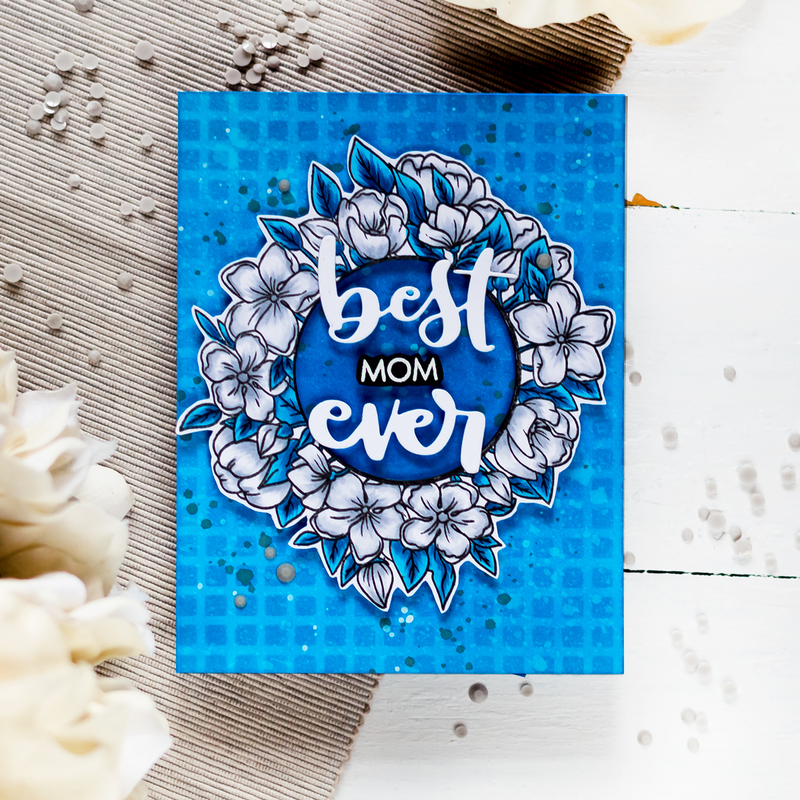 Love your beautiful dramatic card! Wow! Love the brown and orange wood grain. What a great idea!! The colours are gorgeous – thanks for the inspiration. Stunning card, Svitlana! Your colors and layout design are gorgeous. Such a clever card! Love the colors and the technique with the Altenew leaves! Love the bold colors of this card and the use of the lettering in the negative space. That’s a technique I need to try! Wonderful texture and technique used here! Wow! Such a striking use of color and texture. Love it!! Thanks for the inspiration! Dramatic colors and it makes a stunning, striking, beautiful fall card! I love your card. Those colors really pop ! I find so much inspiration here!!! Your card is fantastic! Love those oranges. I love this card! I love what you did with the diecut. Very fun card for fall. This card is so fantastic !! WOW your card is amazing. I love the bold use of color and I love the colder months, so Fall is one of my favorite times of year. I loved reading your story and I am always so grateful to all the crafty online friends who are so supportive and always willing to teach and inspire. Love this fall card, so bright! I absolutely love your blog post. Your appreciation of fellow papercrafters is awesome. I only wish I had been able to attend the Simon Says Stamp event. And yes, I love your card, too. What a pretty fall card! I love the vibrant orange! Love the wood-grain & all the dimension! Oh my goodness! This is so rich and striking and vibrant! Such a beautiful card, love the vibrant orange! Wow that orange is so vivid against the brown…simply gorgeous. This is a HAPPY HAPPY Fall card! Awesome card! Love the bold letters! I love this technique. I am doing something similar for my Christmas cards this year! W O W! That is one gorgeous card! Just love the colors you chose and the bold letters. A very creative and inspirational card. I love the bold orange color on the black background with dimensional letters that pop! THE BOLD COLORS AND USE OF THE ALPHA DIES MAKES SUCH A BOLD STATEMENT….STUNNING. Wow!,it’s all I know to say.Orange has never looked more fall than this.Wonderful card. What a fabulous bright color. This reminds me of my coworker. She loves these colors and while we don’t craft together we both love to sew and have had many discussions about quilts. Your card is bright and beautiful. Love it! What a fun, bold card! I sure would love that big letter die set…hope Santa might bring for Christmas. The raised letters make this card just lovely. Thanks. Tremendous! I love this card! The wood pallet background and the colors are striking. Thanks for sharing. I am really liking the big letters, they look so amazing. Your card has a dynamic vibe to it, that’s for sure! I love fall and I love this textured card, too! This is such a cool card!! Thanks for sharing! How fun!! That bright orange really pops against the dark background. I LOVE how you have “hidden” the letters of ‘fall’; what a great technique! Such a bold and beautiful card. I love hearing about the friendships you have made. Thank you for sharing. I love this fall card! I also really like the popped up word “fall” with the sentiment. This is a great masculine card idea. Thanks for sharing! Such bold colors, yet so clean and simple. Love this card. Love this!! Love the colors and the thickness of the letters!! Wow, I love this amazing card!!! The wood grain stamp just added that special effect!!! Darn, the wood background stamp is already out of stock; hope it comes back in soon. Just love the vibrant colors on your fall card. Fabulous card! I love the textures and bold color contrast- stunning! Fabulous card. Your design is wonderfully creative. I so want this for my fall cards! I love Fall and this card! Love the card! Thank you for sharing!! Great Halloween card. Love the technique. This is so fun! I just purchased the jumbo alphabet dies and now you inspired me with an amazing idea! Great Halloween card. Love the technique and the bright colors. 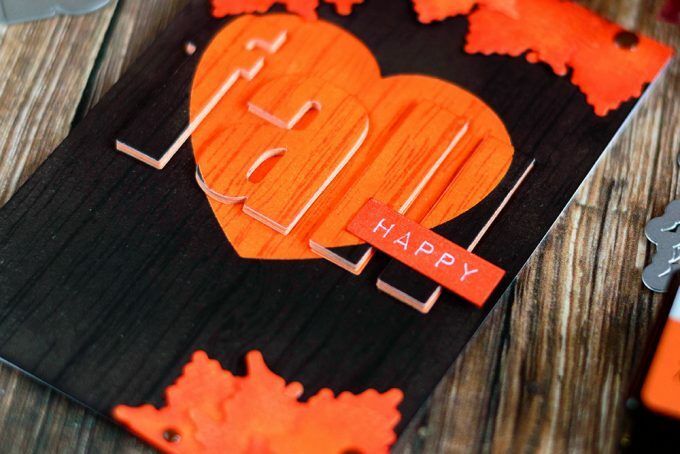 I love the dark woodgrain contrast with the orange heat and leaves on your card! I also really love how you cut “fall” across the heart and layered with orange. Such a great contrast. Thanks for sharing. The Altenew big alphabet letter dies are so wonderful, maybe someday I will be able to get them. Для меня ты мастер текстур и пример, которого стоит придерживаться в техниках! Потрясающая работа! Oh, how very cool! I love how simple, yet interesting your card is! The orange contrasting on the black is beautiful! I was very happy to read your account of meeting so many crafters in one place at Simon Says Create. It sounds like you had a great time and it will be nice for you to meet more friends in January. Have a great day! WOW! WOW! WOW! Amazing card! Love the colors contrast, the technichue, the background, the bald letters! Bravo! Beautiful card! I love the vibrant orange! Wow such an awesome card! Altenew create the bones for crafters to create. You have created a ‘Stunner’ with the wonderful Autmn colours. Stunning card, thanks for sharing. Simply stunning! Love the orange and black and the way the word pops on the card. Thank you! I REALLY like this! Love the leaves especially! The orange leaves are beautiful and like the way the FALL stands out. LOVE the bold contrasting colors! Thanks for sharing! Oh what a fun Fall card!! I will have to try these techniques! Thanks for sharing it! That card is amazing, it jumps off the page. Love the bright color on the dark background. What an awesome card.. It is a privilege to see your work/play! Thank you so much for inspiring me and sharing your knowlege with me. Love that you die cut from the bright and bold orange! What a striking card! Just gorgeous. 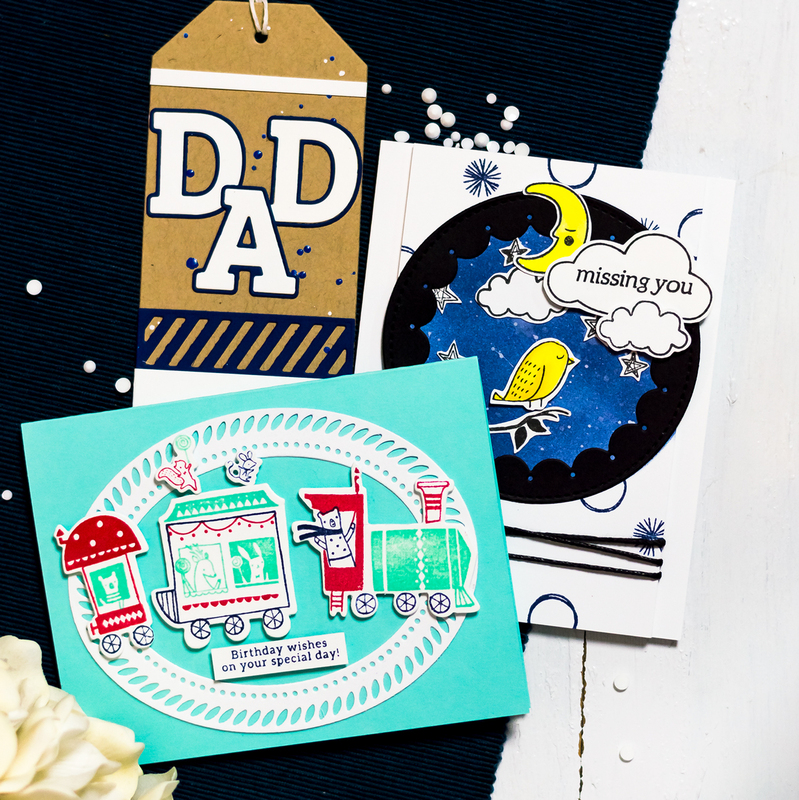 So neat that you have made so many card making friends online. So many America s wish the best for Ukraine! Just gorgeous! So neat that you have made so many card making friends online. So many America s wish the best for Ukraine! Really love the bold colors and simple beauty of this card. Thanks for sharing. Oh wow!!! Fab and unusual card!! Oh my goodness, that card is so beautiful! I love your style. Wow! I love how vibrant the orange is on this card. It really pops. Love this card! You’re technique is fabulous! This is just fabulous! So bold and so perfect!! Fabulous fall card! Love the bold colors and graphic design. Thanks for sharing! What a crazy cool card! Thank you very much for sharing your talents with us. Really like this card–a different approach and a great inspiration. Your card is amazing! The colors are so vibrant! I understand what you are saying about friends – I have the same problem. I have very few and none of them are close. I thought when I moved back to my hometown, I would be spending time with my sister, but that hasn’t worked out which is so sad, because family is so important. I really don’t have a “craft” family here because nobody crafts and I can’t get them interested in trying anything. My solution is that I spend most of my time working with my church. Love the orange and black. I love the vibrant color you used…gorgeous! Fall is my favorite time of year. Thanks for using such vibrant colors. This card is fantastic – it seems so simple, but yet, it has so much depth and character. Very creative! WOW! That orange against the black, with the ‘white space’, really pops! Love how you did the word FALL! Lovely card, I like the wood pallet background. Thanks for sharing! Wow beautiful! I love that die cut effect! Always impresses me when I see it, and the black and orange are a great contrast. Love the contrast in colors. Very nice. Wow!! LOVE, LOVE, LOVE your card!! The colors, the layout!! It is stunning:) Thank you for your inspiration!! Great card! Loved reading your story! Such a happy card indeed, love the bold colors. Your card just says autumn just by the colors! Love the raised letters. 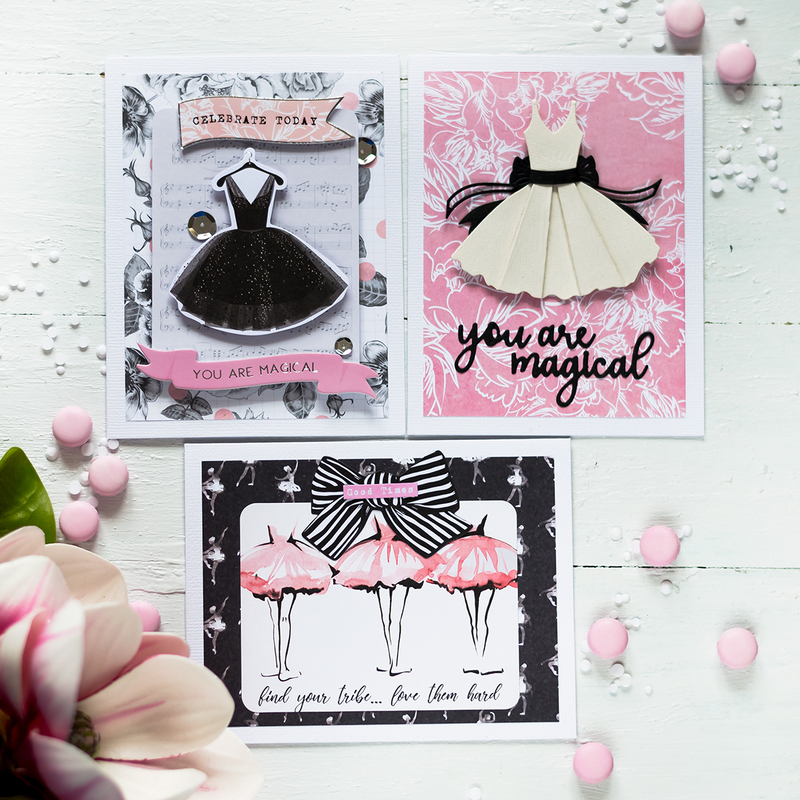 Your cards are always so striking and stunningly different – love it! Svitlana, it would be a wonderful treat to meet you! I LOVE New York and I will definitely be in touch the next time I visit! This gorgeous creation just shouts Autumn!!! absolutely gorgeous! Love this bold beauty. I own those amazing alpha dies. Now I see that the orange inks have to be next on my wish list! I just love the big bold sentiment…and neat way to incorporate the orange heart in your sentiment. The vibrant orange on the black is fantastic. black so it seamlessly carried on the word. WONDERFUL way to add dimension and color to an “ordinary” word die! Beautiful! Stunning colors and I love the popped up sentiment! Great color combo it really pops and I love the dimension! My favorite Time of Year. I see some new dies in My future. Wow that is a great looking card! Those dimensional letters look very nice and I love that wood pallet on the background! What a fun card! I love how you popped the letters out. Stunning! Love how the orange pops against the background! Your cards is gorgeous, I love the bold vibrant orange with the black, its one of my very favourite colour combos!!! The wood grain looks amazing too. I really enjoyed reading your story, I am like you I have very few friends and none of them are near. Thank you for sharing your story and your stunning card! LOOOOVE Love Love this card!!! Orange is my favourite colour so you had me there but everything else you did to create this masterpiece makes me love it even more! Never would have thought to stamp a background and then ink over it with the exact same colour. Such a great result! Gorgeous card!! Beautiful card! You always do such beautiful work! Thanks for sharing! I too love the striking colors you used. I also love the raised die sentiment! What a outstanding card, great colours, I love it! What a striking card! Perfect balance of the orange and the black, and I love the dimension! FABULOUS card! I love everything about it! Fall is my favorite time of year and these colors are fantastic! Loving this blog hop celebrating crafty friends and I love hearing all of these great stories! Thanks for sharing yours! I too hope to be part of this wonderful crafty family some day! Wow! I love the fall look, the colors are great. This is so gorgeous! I love that beautiful contrast between the orange and the black – -so bold and graphic! LOVE! What a stunning card! I love the simple graphics and the bold colors! I love how the sentiment blends into the background! WOW! Your card is just stunning! Your card is wonderful and I love eclipse technique. So this blog hop is a very sweet idea. I love the vibrant Fall colours and that woodgrain. Gorgeous! gorgeous card. the orange on black is stunning! 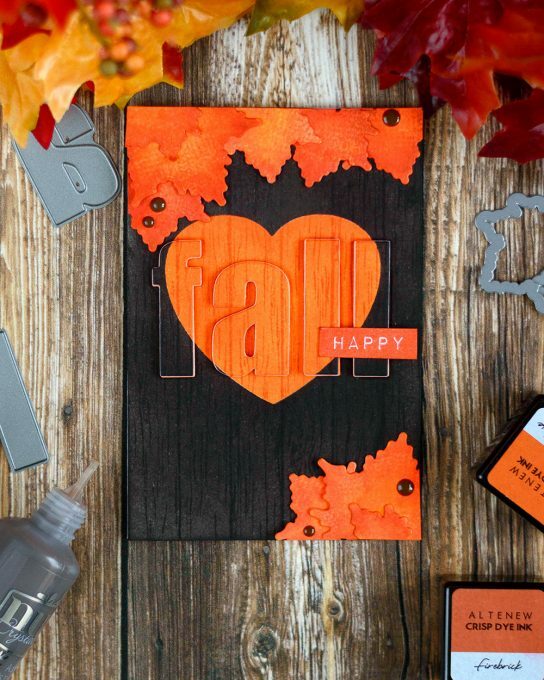 Gorgeous fall card with the gorgeous orange against the black! What a great card! I love the color combination! Love your beautiful fall card. The raised FALL looks great. The card is absolutely gorgeous. The color combo is stunning! So stunningly gorgeous!!!! I love the hidden die cut and the colors and just fun! Lovely card! The die cut is fabulous and I love the colours you used! I love your card! The bold colors really make this pop! Amazing job! This is my absolute favorite card on the hop…the design and colors are stunning. I love everything about this card. The color combination is perfect. om! I just love that beautiful orange with the black it just seems like the card is ON FIRE! (Which in a sense it is!!!!) It is just on Fire Gorgeous! You did a stunning job on this and I just love how the word Fall Just Pops right off the card! Excellent job! TFS! The colors are gorgeous. May the number of your friends explode with your creativity. What a GORGEOUS card! Love how you did the letters….gonna have to try this technique. Thanks! I really like this fall eclipse card. Not many people would make the background so dark but it soooo works here. Love all the colors and cuts. I really really love this card!! What a wonderful idea! Your work is stunning! Thank you for sharing! Just amazing! I adore the contrast of colors you chose. I’m a big Fall person so this is right up my alley and I love It! What a beautiful card! Simple with only two colors, bold with that orange and incredibly detailed when you look closer. Well done! Wow this is beautiful! Love the way it blends together! Fantastic design! The colors, the texture! Wow! Great card with fabulous colours! Stunning! Bold! Fabulous! Love your color selection. Thanks for sharing this fantastic card with us. I’m looking forward to trying something like it. Stunning card. Love the colors and the dimensions .